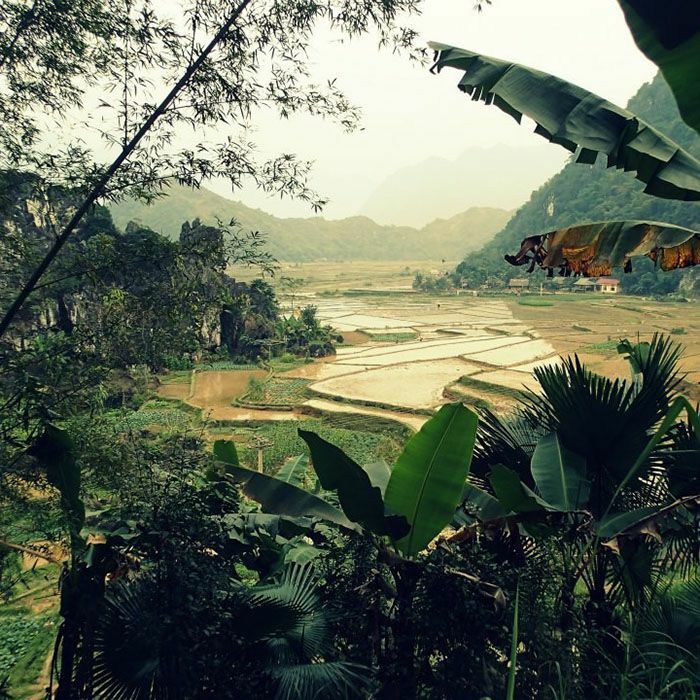 Discover the minorities of northern Vietnam, the last great living ethnographic sanctuary, in a forgotten province of mass tourism. We invite you to meet these ethnic groups on foot, with an average of 5 hours walking per day. Hiking itineraries may vary slightly depending on availability of housing and local events, but they are always in the same area. 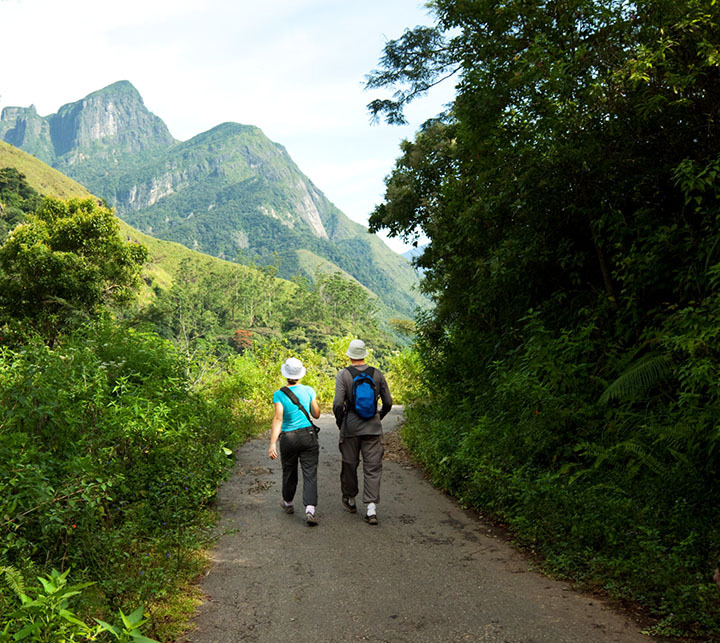 This trip includes 8 days of walking of a medium level without difficulty. You are greeted at Hanoi Airport by your driver. After settling into the hotel, you immerse yourself in one of the only Asian capitals that has reconciled its past with modern development. Depending on your arrival time, you have the opportunity to visit the museum of ethnography, which will prepare you for your adventure. Dinner at the hotel (included). Nearly ten centuries ago, King Ly Thai To saw a dragon rise above the river. The dream was revealing. The location of the capital was decided, as well as its name Thang Long (the Dragon that takes off). The consultation of astrologers and geomancers gave an urbanism of which we can still see the traces. The emulators of Haussmann during the French administration exercised their devastating talents. But the city-garden dotted with lakes still has beautiful remains. Whether royal, commercial or intellectual, the activities have their own neighborhood. At the end of this day you will take a night train to reach the high region, starting point of the trek. Full board. 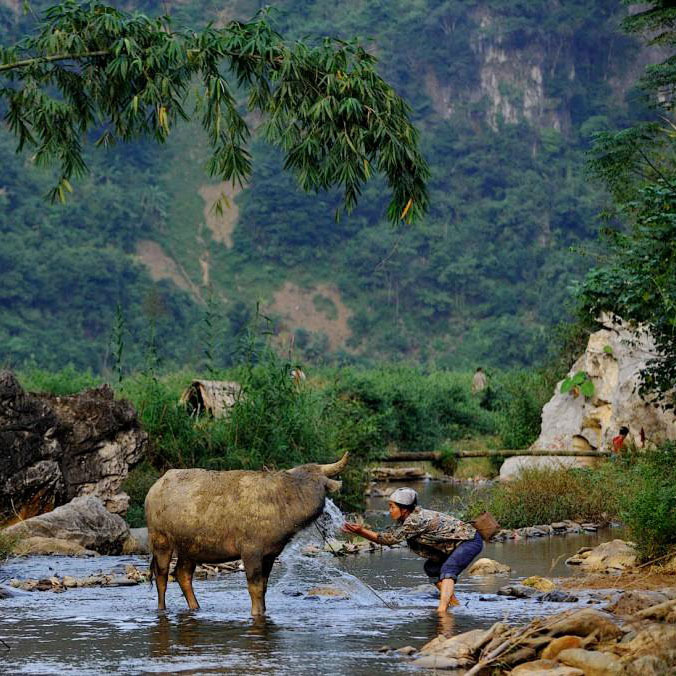 You wake up at dawn to join Lao Cai. On a beautiful winding road between the hills crowned with lataniers, you join Bac Ha to have breakfast. It will take you another 2 hours to reach the starting point of the trek where the porters are waiting for you in Ban Lien. The Long Tunic Yaos are cousins of the Thai, those found south of the Red River, Laos, Burma and of course Thailand. They are the oldest occupants of the place, and thus have the best land in the valley floor. You pass a pass before you find yourself in the Nan Dan Valley where you will spend the night at the inhabitant. Full board. You walk along the valley of Suoi Nam. The farms on stilts Yao, backed by the mountains are always close to the water, they succeed in a landscape of rice terraces. Mount Ki Liou Ti, where Song Chay originates, is populated mainly by Hmongs Hoa, Man Ta Pan, Tays, long tunic Yaos and Nung Inh. 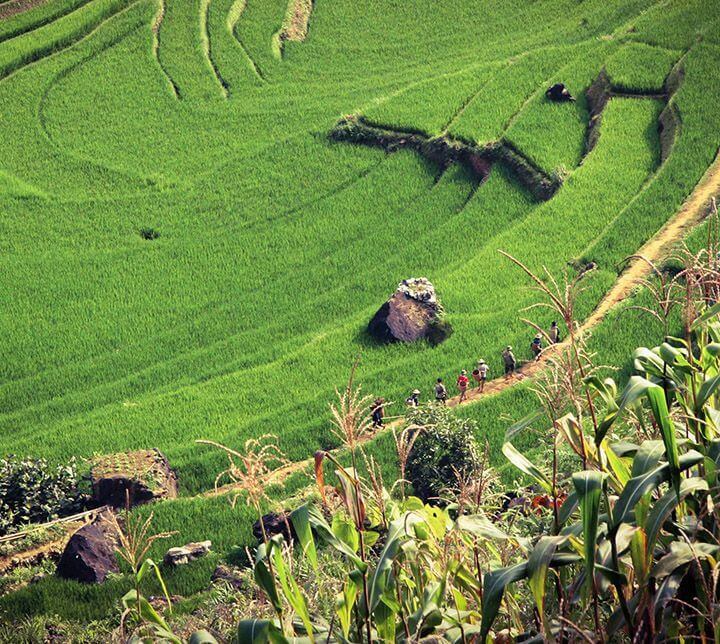 The walk continues through rice fields, lataniers and houses on stilts up to Na Chi. 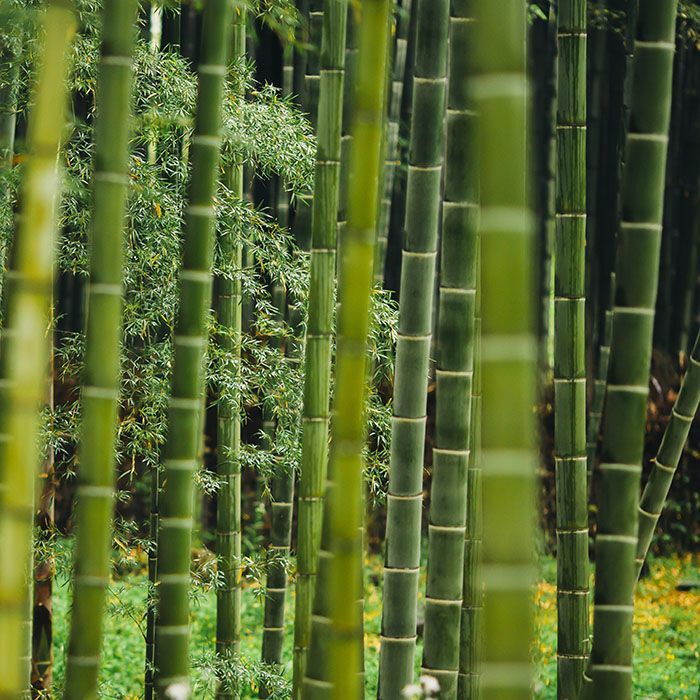 You cross beautiful bamboo forests. Tonight, you spend the night at Thai Na Chi. Full board. For this third day of walking, the landscape changes gradually. The reliefs are accentuated, the population is sparse, leaving room for the mountain forest with its tree ferns, its enormous futs where nest orchids. Then you cross the river Bac and rice terraces, rivers bordered by bamboo, hamlets of houses on stilts backed by reliefs. You go back to the forest again. You sink into the heart of the Song Chai Massif with incredible panoramas. Your stop for this night is the village of Quang Ha. Full board. The walk continues towards the north-east of the country. You pass to a lanscape at 1300 m. Now you are in the heart of the Claire River Massif. On the way, you come across Tay, Nung, long tunic Yaos, Man Ta Pan, colorful Hmong ... You enter Nung An territory. Like most people of the northern mountains, they came from China fleeing famines or persecutions . 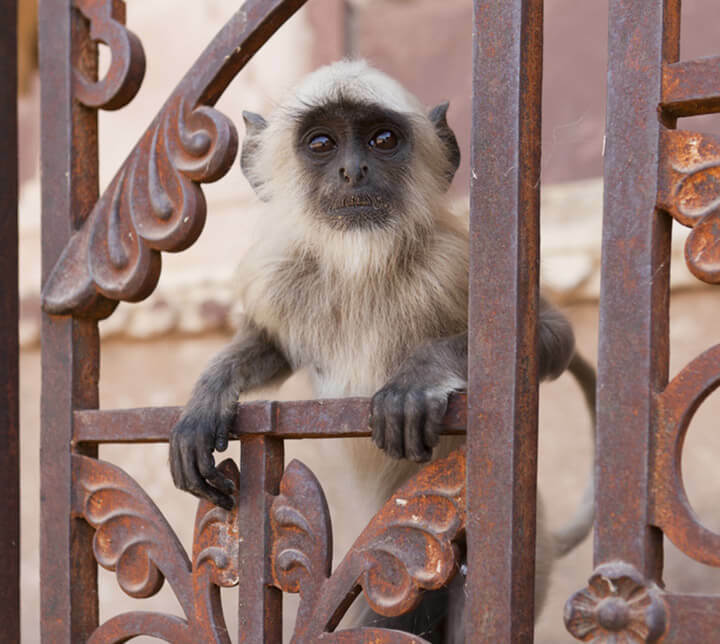 They are among the last arrived in the 18th century. Originally from Khouang Xi and Yunnan, they are part of the Thai nation and speak their language. You sleep at home. Full board. The highest peaks in the region do not exceed 2500 meters, and the vegetation is a mixture of tropical flora composed of rattans, orchids and bamboos, and alpine flora composed of conifers or trees of the family chestnut - chestnut which, incidentally, are native to this part of Asia. You walk to Nung village where you spend the night at the inhabitant. Full board. 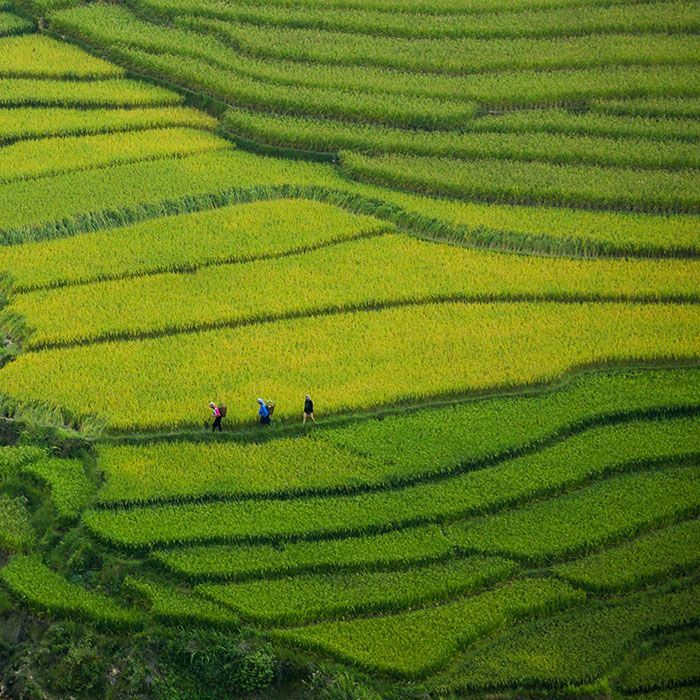 From valleys to passes, you enter the heart of this region kept secret by its isolation, where the mountain people live from the culture of Shan tea, the harvest of cardamom and many medicinal plants for the Chinese market. 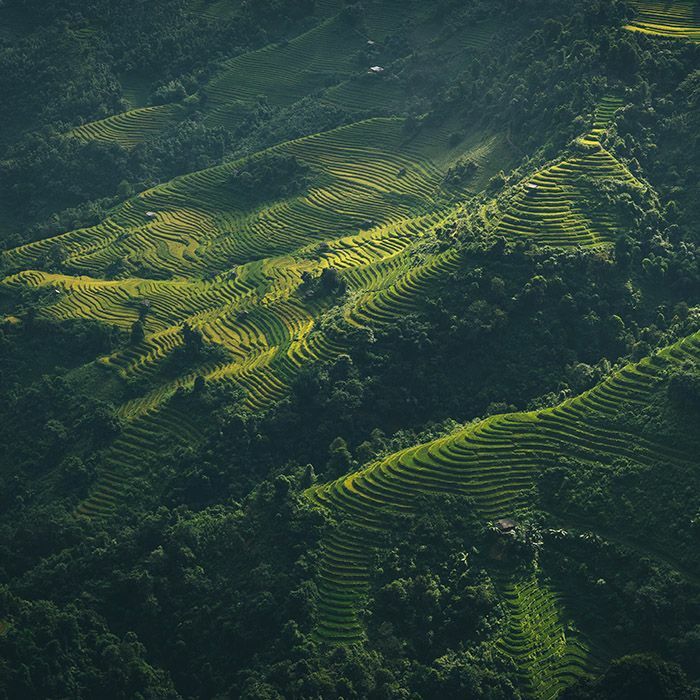 The inhabitants have spread the territory in a kind of mosaic according to the altitudes: the Hmong at the top, the Yaos on the mountain slopes between 500 and 1000 m, and the Tays in the bottom of the valleys with more fertile lands. Strangers to each other, with different customs and languages, they are nonetheless neighbors. You will certainly meet Nung and Dong long tunic. Full board. 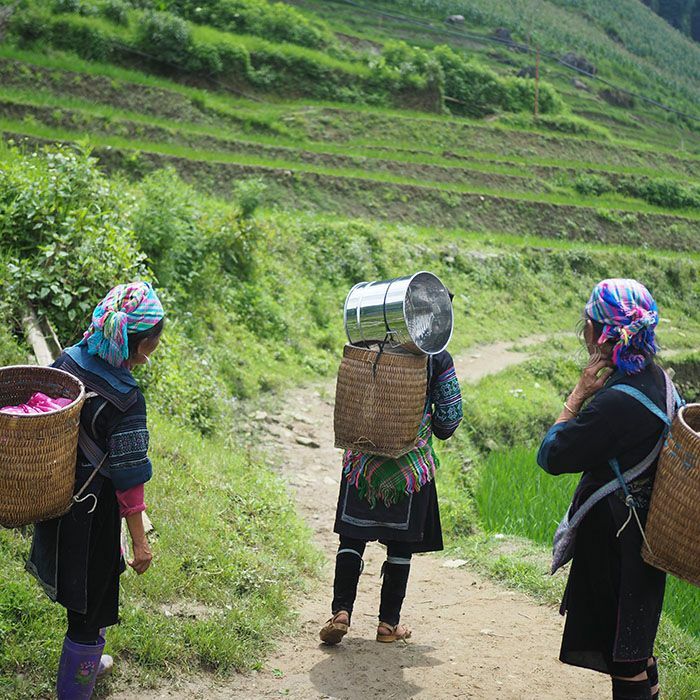 The slopes are streaked by rows of teas in the Song Chay Massif that adjoins Yunnan. This natural fortress has long been a shelter for the many ethnic groups who fled the Middle Kingdom. You enter the domain of Man Ta Pan. 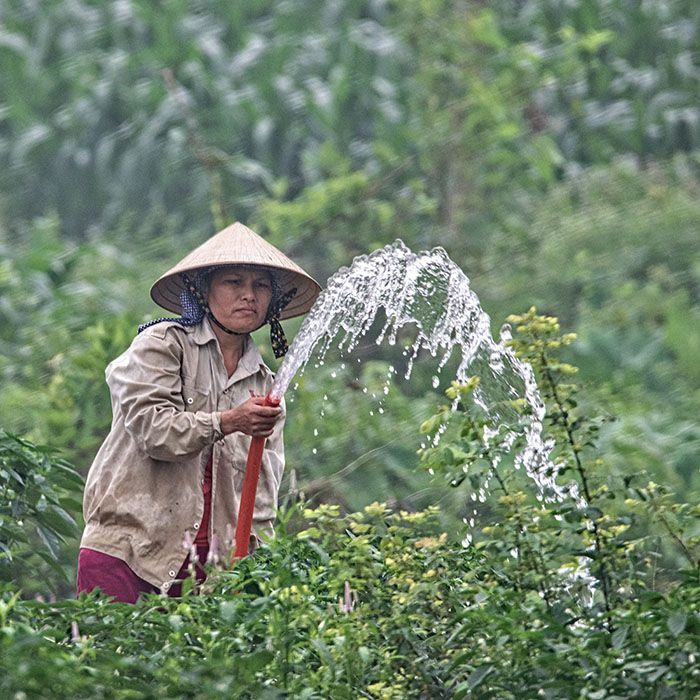 They are specialists in Shan Tuyet tea culture and their knowledge of the forest has given them a great mastery of phythotherapy. Each village has its shaman communicating with spirits. They are one of the 12 descending Yaos tribes of the Dragon Dog Pan Hou who married a Chinese princess of royal blood after taking up the imperial challenge to kill the enemy leader. The term Yao means exempt from chore because the emperor, to reward Pan Hou, freed from all taxes and duties his descendants and gave him half of the kingdom, dividing it in two in the sense of height. This is how the Yaos were confined to the mountains. Your hosts tonight will be Nam's Man Ta Pan. Full board. Cross the Porte du Ciel, a pass crowned with forest of rare species and where flourishes a tropical and temperate flora, like trees of the chestnut family or tree ferns and orchids. You pass through Phin Ho, Man Ta Pan village, famous in the province for the quality of its tea, picked on old trees. Often, in the morning, appear only the tops floating on the sea of clouds foam. 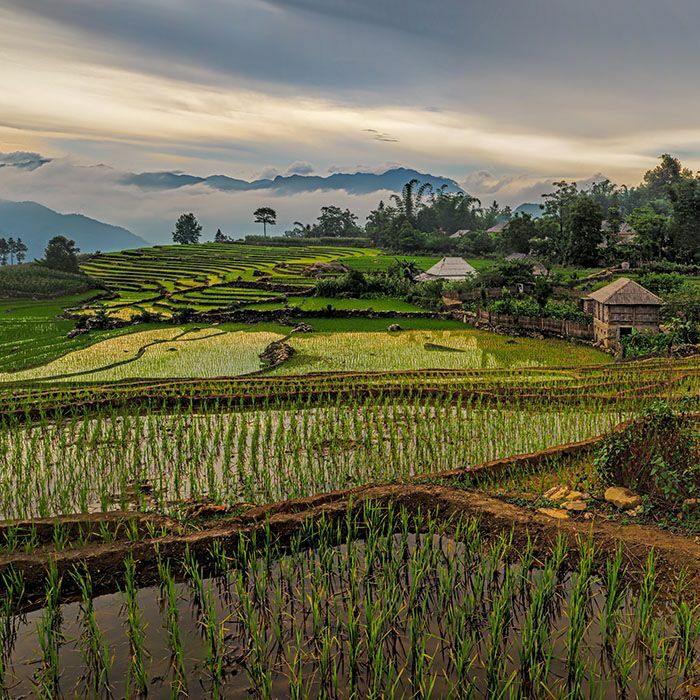 Later, the sun will sweep all these clouds and then rise the contours of terraces and the network of bunds Tay ricefield in the valley bottom. You arrive at the village of Pan Hou, Madame Tien and her team prepare a traditional bath with medicinal plants, restoring and relaxing virtues. Full board. 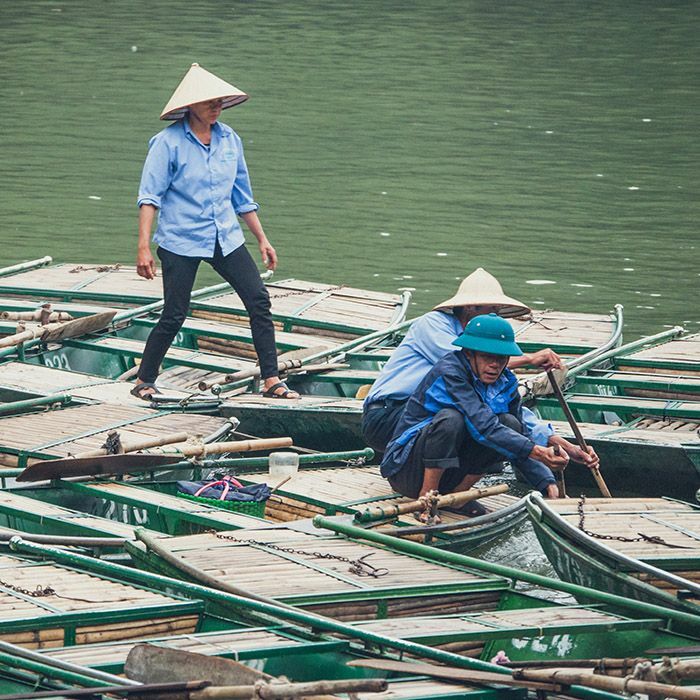 You take the road to Hanoi in the morning through the central region and north of the Red River Delta. 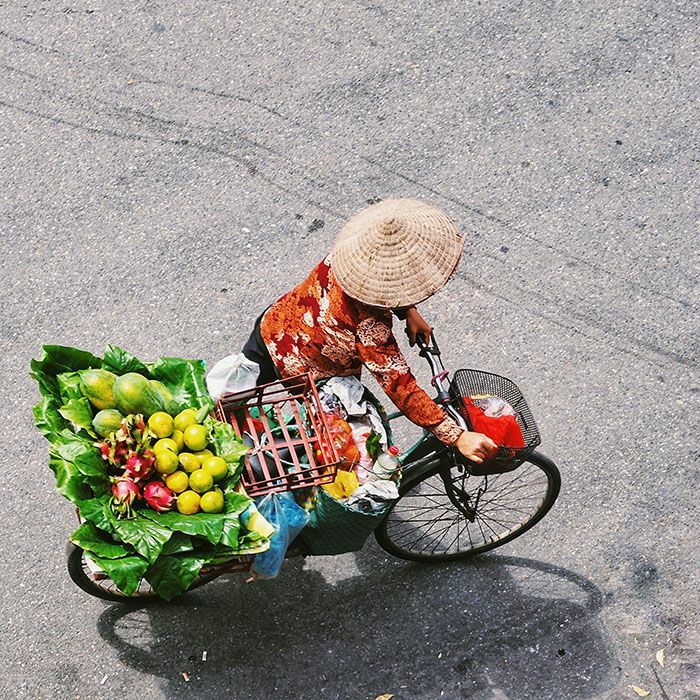 You arrive in Hanoi in the middle of the afternoon. Lunch included. 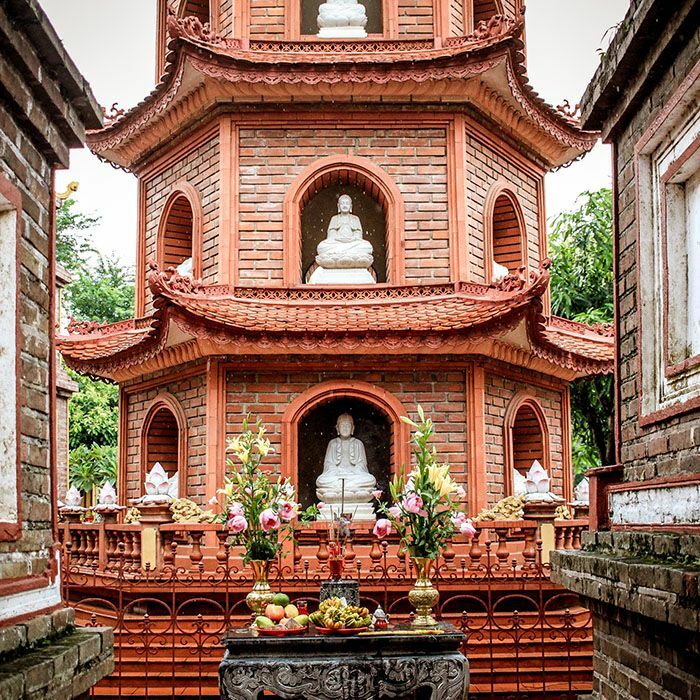 Take the road to Dinh Vu, on the shores of the China Sea. You embark on a speed boat and join the island of Cat Ba, one of the largest islands of Halong Bay. 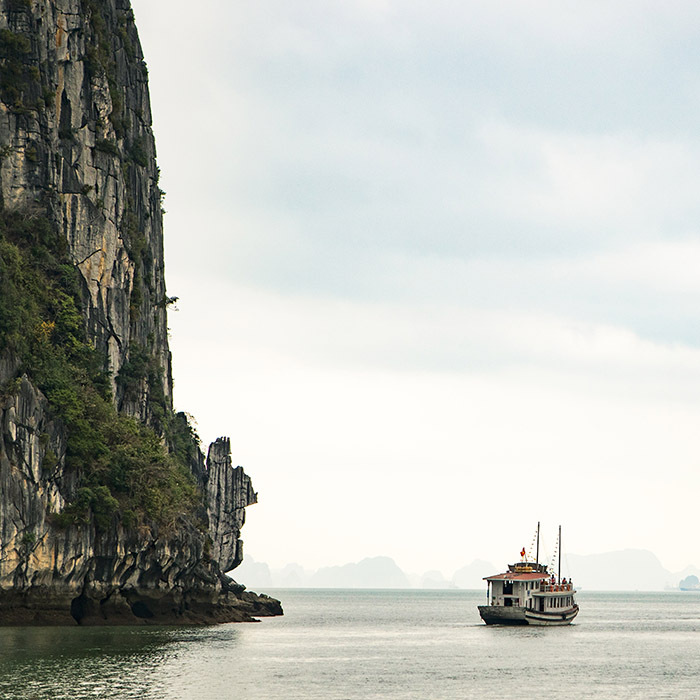 Change boats to one of the most beautiful Halong Bay, Lan Ha Bay. This is the starting point for a complete crossing and off the beaten track of the karsts and islets of the bay. Your boat sneaks in the middle of hieratic peaks, shape and size in perpetual renewal. But the bay is not limited to a landscape, it is also a place of life for many fishermen who settle on floating villages to practice fishing or raising fish. You arrive in a deep, magical bay with a perfect-shaped karst peak in the center. The end of the day will be free. 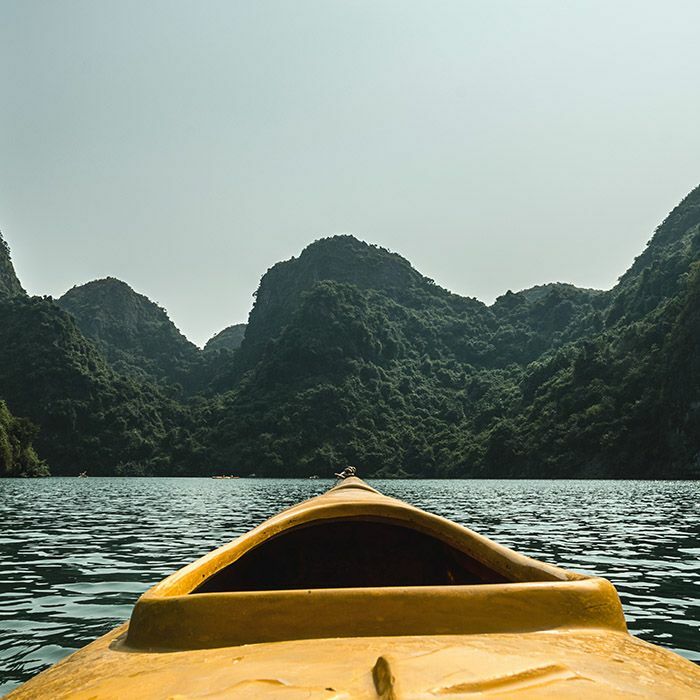 Rest, swim, kayak between the karst peaks of the bay, you have the choice. Full board. Aurora and twilight show unreal scenery. After breakfast, the boat continues its journey through the thousands of sugar loaves emerging from the turquoise waters. This changing landscape at any time, from fog to bright sun, amazes you throughout your cruise. Nomadic fishing populations live from the bay and gather there in floating villages. After lunch drive back to Hanoi, where you reach Noi Bai Airport.